Our son David was a healthy full term twin boy. In April 2010, at 23 days of age, we noticed his scrotum looked swollen on one side and seemed tender to the touch. He wasn’t crying and it was after hours on a Sunday. We took pictures and called the pediatrician call service. The pediatrician on call told us that it would be a hernia or liquid build up. The former, she said, if it was serious, would be extremely painful and since David wasn’t crying in agony and was in fact sleeping by the time she called us, we shouldn’t worry. Bring him in the morning for a 10 am appointment instead, she said. David slept as usual at night, although he spit up his milk which was somewhat unusual for him, but since it isn’t that unusual for babies to spit up we were not too alarmed. In the morning, David seemed lethargic. At 8 am we received a call from his regular pediatrician saying that she reviewed the call notes from the night before and she wanted us to bring David in right away, she urged that this couldn’t wait until the 10 am appointment. When I brought in David, a team of 4 people surrounded him, examining him. He cried when people handled him, but otherwise was lethargic. The pediatrician calmly told me that David had a hernia that she could not readjust, but that a skilled surgeon’s hands will do a better job and to take him to children’s hospital for an appointment that she already made for David. She said that once his hernia is pushed back in (by hand) we would wait until he was strong enough and weighed enough to operate, about 6 months down the road. I said ok, but that I had to go back home first and leave milk for David’s twin brother. She looked at me and firmly said “you can’t go home, get in a taxi now”. On the way to see the surgeon, I fed David. By the time we got to the hospital (10 minutes later) he was projectile vomiting with heavy mucus discharge. The surgeon examined him for 1 minute and the next thing we knew David was being prepped for emergency surgery for an incarcerated inguinal hernia. He weighed in at 6.0 lb on the surgery table. We know now that at the time David was rushed to surgery, he had only hours to live because infection was setting in very quickly and he was so little and weak. David is a healthy and happy 6 year old now. Thank goodness our pediatrician recognized the severity of the situation when she did. 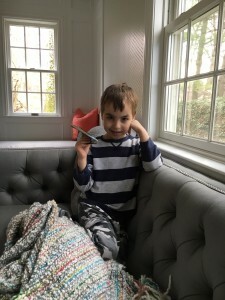 If we knew what we know now, we would not have listened to the “on call” pediatrician, would have not put our baby to bed that night, and would have taken him to the ER. Hours and minutes were critical to his survival. Our experience also helped us recognize the situation and act very quickly when David’s twin brother ended up with an inguinal hernia 6 months later. We hope David’s story will help save a child.